Every kid knows Benjamin Franklin because of his interesting experiments with electricity in the first place. The postmaster, diplomat and author, he was also a great philosopher, inventor and philanthropist. This man made multiple contibutions to the world society, but, nevertheless, we will review only eight of his greatest accomplishments. 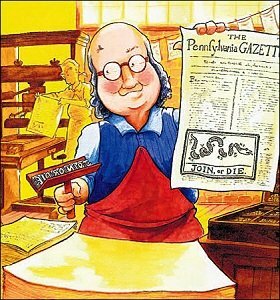 Already at the age of 21 Benjamin Franklin succeeded in establishing a well-known Junto club for different tradesmen like cabinetmakers, glass makers, surveyors and printers, so that they could discuss all the current events. Later, in 1743 a great inventor decided to create American Philosophical Society. It exists even now. His second great accomplishment is the Library Company for Philadelphia, which was established by him in 1732. In order to borrow books the library members had to pay dues. Nowadays this library consists of more than 500 000 books! Among Franklin’s achievements one could name his famous book “Poor Richard’s Almanac”, which included useful information including phases of the moon and predictions together with riddles and jokes. Soon, an interesting and humorous book made Benjamin Franklin not only famous, but also wealthy. When Benjamin Franklin was 30 years old, he organized a first fire company of Philadelphia. After the tragic events that took place at Fishburne’s Wharf, Ben wrote a couple of articles for the Gazette with a wide range of tips and suggestions for fire prevention and preparedness. Another accomplishment of Benjamin Franklin was the invention of the famous Franklin stove in 1744. Franklin turned down a patent that could have made this man a fortune. In his memoires Benjamin Franklin stated that his invention had to, first of all, help other people. Later, with professional assistance from Dr. Thomas Bond, Benjamin Franklin established the first hospital on the territory of North America. Dr. Bond studied medicine in England and France and was a fellow member of the USA Philosophical Society. With the financial support from Benjamin Franklin, the hospital opened its doors in 1752. Today it’s still operating! To add more to the list of achievements, it is important to mention that Ben Franklin was also the inventor of bifocals, which were necessary to help him with the failing sight. He had glasses that worked good for reading and for viewing objects in the distance. Franklin had the lenses of every pair of glasses cut in half and linked so that he could just move his eyes up or down depending on whether he needed to see something closer or further. Finally, at the age of 83 Benjamin Franklin became a signer of the Declarations of Independence and the Constitution of the United States of America. Besides, he also signed a special petition to the first USA Congress that was dedicated to the end of the slavery!